China's icebreaker Xuelong set sail on Friday morning for its 9th Arctic research expedition with a team of 131 members aboard. Xuelong at the dock before departure. 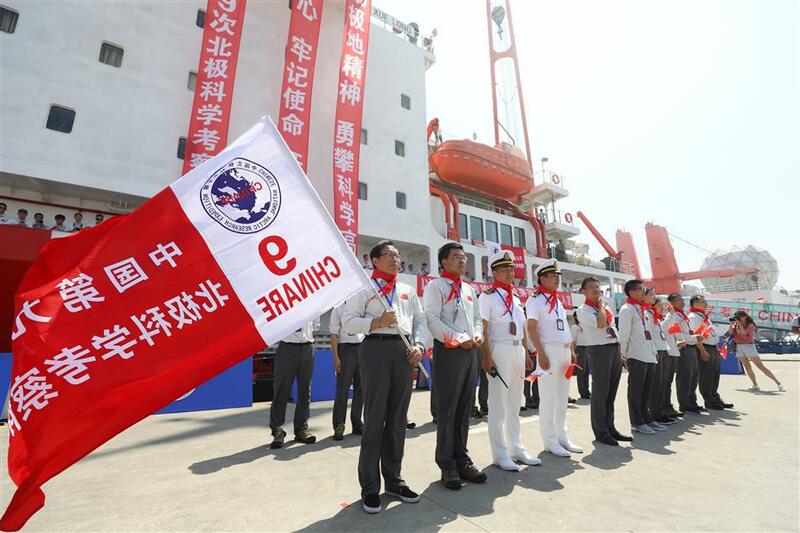 China's icebreaker Xuelong, or Snow Dragon, lifted its anchor in Shanghai to set of for the North Pole on Friday morning for its 9th Arctic research expedition, the Polar Research Institute of China said. Carrying more than 130 crew, the vessel is scheduled to return to Shanghai in late September after a journey of more than 12,300 sea miles. It's the first polar expedition organized by the Ministry of Natural Resources, which was formed in March. 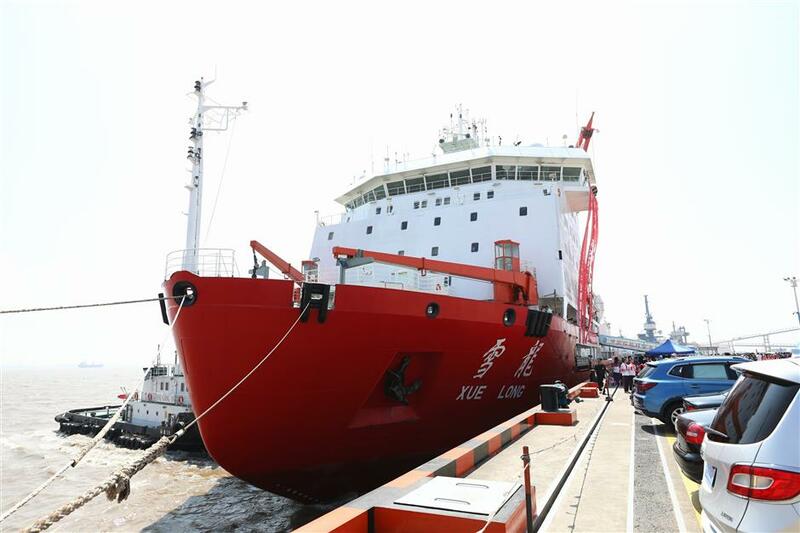 The nation's first domestically-built polar research vessel and icebreaker Xuelong 2 will be put into use in future Arctic expeditions because it's better equipped with scientific research facilities. According to the institute, compared with previous Arctic expeditions, this journey takes less time but will undertake more tasks with more young people involved. This expedition will push forward the country's construction of an observation network in the Arctic and conduct research in some key areas like the Bering Sea, the Chukchi Sea and high latitude zones of the Arctic Ocean. Research will also be done on hot issues such as the ecological environment, fishing resources and new types of pollutants in the Arctic. Radionuclide, marine microplastics and ocean acidification are all subjects among their research. Wei Zexun, a chief scientist of the expedition team, said some new research tools will be applied in this expedition under a trial basis, including an unmanned ice station. The research team also plans to enter the central areas of the Arctic to test the seaworthiness of the central channel and do some preparation for the Multidisciplinary Drifting Observatory for the Study of the Arctic Climate (MOSAiC). International cooperation will be launched between the expedition team and two foreign universities from France and the US. Three of their researchers will accompany the Chinese team to the Arctic for research. "The main target of international cooperation this time is ocean acidification research," Lei Ruibo, a chief assistant of the team said. "In recent years, the ocean acidification problem has been growing worse and drawing people's attention — collecting data is very important." Lei said as well as allowing foreign researchers to be aboard the Xuelong, Chinese scientists will board other countries' vessels for future projects. A group of research team members stand in front of the vessel.